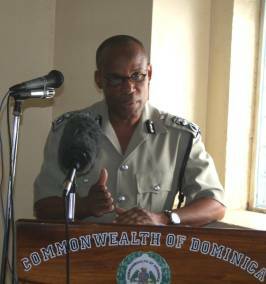 Roseau, Dominica – August 25, 2008………Commissioner of Police, Mr. Matthias Lestrade has told granduands of a “Community Policing -Train the Trainers Workshop 2008” of their responsibility to the community following the conclusion of a ten (10) day workshop. Community Policing is a collaborative effort between the police and the community that seeks to identify and solve community problems. Mr. Lestrade noted that the concept of community policing is not a recent phenomenon. “Viewed from one perspective, the principles of community policing can be traced back to some of policing oldest traditions. What is new, however, is that it is a policing style that is responsive to the needs of the community and involves the redesigning of roles and functions for all police personnel”. In his remarks at the closing ceremony, Minister for National Security, Hon. Rayburn Blackmoore said that members of the public are demanding more from the Dominica Police Force. The workshop was facilitated by Quality of Life Associates Inc led by Dominican-born Sociologist and Criminologist, Dr. Peter K.B St. Jean. The team also included Mr. Vernon White, Chief of Police, Ottawa, Canada. Dr. St. Jean, while acknowledging the level of enthusiasm in the Force and in the community itself, recognised that harder work needs to be done “within the Police Force than within the community itself”. Community policing represents a bold new approach to law enforcement. It represents a comprehensive attack on community problems and an ethos where the police are more focused on community concerns and problems, responding to calls for service and effecting arrests.